The Pro Slammer king, John Zappia may set a new national record at the Perth Motorplex last night, but Grant O’Rourke was ultimately crowned the Home Group WA Westernationals champion. Zappia had earlier made 400 Thunder history by posting the quickest ever pass in class history, a stunning – a 5.683-second run at 408.39km/h from his Fuchs Holden Monaro. But the hometown hero’s run at the Westernationals title came to a sudden halt on the startline of the final round with a broken valve, leaving O’Rourke unchallenged in taking a popular win with a 5.942-sec/394.94km/h pass. “Zappia’s the king of the kids, so any time you face him in the final you have to be prepared,” O’Rourke said. Zappia was left disappointed, the opportunity to clean sweep the event falling short at the final hurdle. “Our record-setting run was a picture perfect run – dead straight. The car left the line and didn’t wheel-stand too high and just felt beautiful,” Zappia said. Zappia backed up his new Pro Slammer elapsed time record 5.683-sec pass with a 5.707-sec run in the opening round of eliminations. Pro Alcohol legend Gary Phillips got his 400 Thunder national title campaign back on track by clean-sweeping the Westernationals – taking the top qualifying spot, the bonus points for lowest elapsed time and top speed of the meet, and winning the final round in a stunning weekend of racing for the methanol-fuelled category. In the final round, Phillips ran a blistering 5.441-sec/426.75km/h pass to down points leader John Cannuli’s 5.638-sec/413.97km/h. “It’s tough when everyone’s throwing 5.45s at you, but we put together a perfect weekend. There is nothing better,” Phillips said. The Brisbane-based racer feels his Lucas Oil Products Chevrolet Monte Carlo has the potential to even more break records when he returns to the world-class Perth Motorplex in two weeks for the West Coast Nitro event. “I’m coming back with all guns blazing. I’d been struggling with my new car, but we’ve found the sweet spot and it’s just about flawless now. In the 400 Thunder Sportsman ranks, Stuart Moresby took out Competition Eliminator, Ralph Lewis claimed Super Stock, Jodie Mellitt in Supercharged Outlaws, Lorenzo Gullotto was Top Sportsman champion. Modified was won by Simon Barlow, with Laurence Adamos taking out Super Sedan, Paul Garbellini in Super Street and Jack Wasley in Junior Dragster. In the two-wheel ranks, Brett Ghedina topped a tough Competition Bike field and Murray High claimed Modified Bike honours. 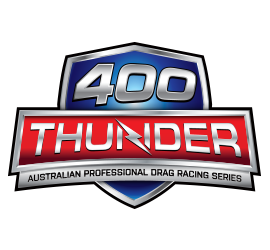 Perth Motorplex hosts another two major 400 Thunder events in the coming weeks, with Top Fuel, Pro Alcohol and Pro Bike headlining West Coast Nitro from 19-20 February.